Last week, on November 9th and 11th, we had another wonderful training (workshop) at University of Victoria, this time organized by JASCO. 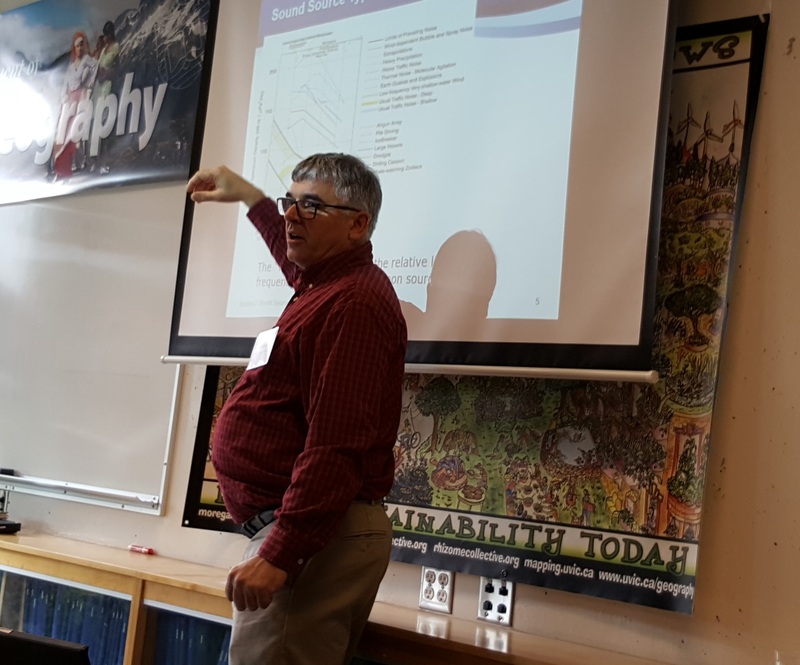 The instructors of the course were Dr. Harald Yurk and Dr. Graham Warner, which provided an excellent introduction to underwater acoustics, sound sources, introduction to propagation modelling and impacts to marine life, noise mitigation strategies, acoustic monitoring programs, and more. You can download a detailed agenda here. The training was very well attended (total 30 participants), with representatives from a number of NGOs, Universities, private industry and the Department of Defense. On the week of September 12th at the University of Victoria, the NEMES team, along with some of our fellow MEOPAR projects MEOPeers (try saying that after a few MEOBeers) and our project partners from ONC, were fortunate enough to attend a workshop delivered by the Canadian Navy on Passive Acoustic Analysis. This presented a unique and useful opportunity to learn about passive acoustic techniques for identify vessels using acoustic data gathered by hydrophones, the kind of which many of our projects collect and deal with. 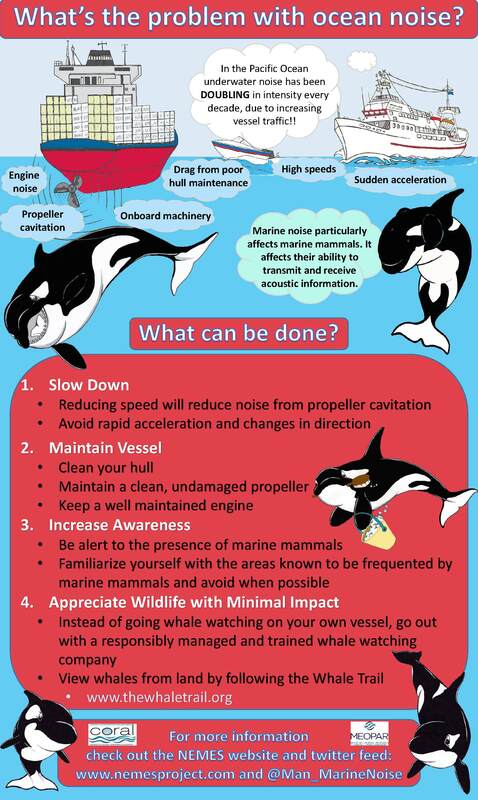 The workshop focussed on all aspects of vessels and their resulting noise, this was beneficial for better understanding the impacts of vessel noise on marine mammals in the Salish Sea, a primary component of the NEMES project objectives. Naval Sonar Operators, Randy and Rodger were our instructors for the week, and their expertise in the field of Passive Acoustic Analysis made for an interactive and fast paced experience. The first days introductions gave us some ‘sound’ background knowledge and insights about the theory behind Passive Acoustic Analysis. We also learned terminology, as well as some of the behavioural characteristics of sound travelling through the water column, which would help us understand the more practical elements of the course material later in the week. Over the next few days we became familiar with the acoustic signatures associated with different classes and characteristics of vessels. Factors influencing the acoustic signature of vessels such as the engine type, speed of the propeller, and auxiliary features on the vessel were analyzed both acoustically, and visually through a spectral gram. Using dynamic events occurring when a vessel passes by a hydrophone, we were introduced to formulas that we can use to determine the speed and range of passing vessels. Furthermore, we learned to identify different types of interference, or phenomenon produced by moving vessels to decipher various identifying characteristics of the target vessel. We wrapped up the course by using our newly acquired skills to identify characteristics of unknown vessels using attributes such as the speed of the propeller and engine type by listening to acoustic data from hydrophones. Lauren can also now do a pretty accurate impression of both a 2 stroke and 4 stroke engine but that oddly enough wasn’t one of the original outcomes on day ones slides! We (the NEMES MEOPeers) would like to extend a huge thank you once again to Randy, Rodger and Dugald from the Canadian Navy for helping to organise and deliver this course and also to Tanya Crawford and MEOPAR for enabling this workshop to happen. 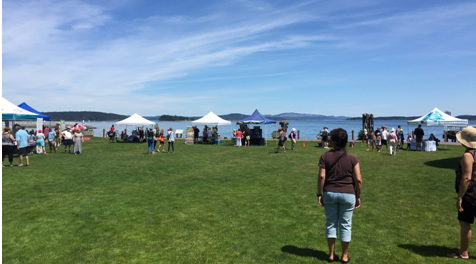 Our project partners SIMRES kindly invited us to attend Saturna’s famous lamb BBQ for Canada Day which the Saturna Island Community Club has organized every year since it began in the 1950’s. The NEMES team arrived on site early to set up their outreach booth within the SIMRES tent (something they were very thankful for when the morning weather took a turn for the worse!). At the booth people had the opportunity to color cartoons designed by Lauren, take home our ocean noise activity booklet and small boaters outreach pamphlet. The booth also contained a computer station and headsets for people to listen to whale calls and samples of vessel noise and watch our ocean noise animation. 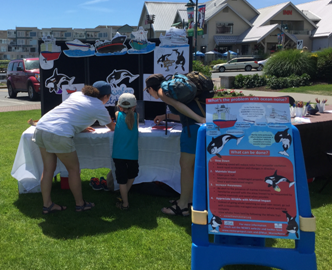 In addition, the NEMES team collaborated with SIMRES to provide kids (and as it turned out more than a few adults) with the opportunity to become an orca for Canada Day! 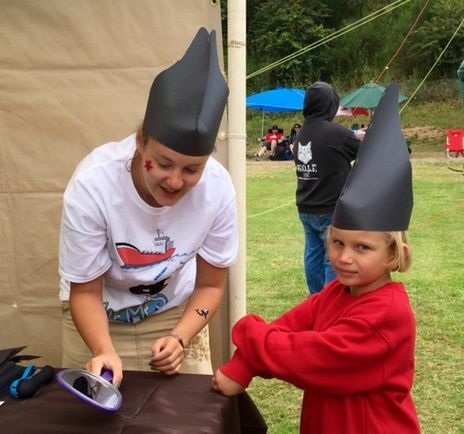 This fun activity consisted of making a Southern Resident killer whale fin hat and face painting. Kids loved being able to pick which whale they wanted to be, getting the choice of either Granny or Mega, and by the end of the day we had a pod of cute male and female killer whale running around the BBQ field. We want to specially thank SIMRES for providing the space for the NEMES outreach booth (particular mention of thanks to Maureen who looked after a sickly Lauren for the weekend) and to Robert Newel of the CORAL lab who volunteered at this event with us. This year’s World Oceans day also marked the start of a summer full of outreach events for the NEMES team. Celebrations got underway early on the 5th of June at Shaw Ocean Discovery Centre family day, held outside the aquarium in beautiful, (and very sunny) Sidney. 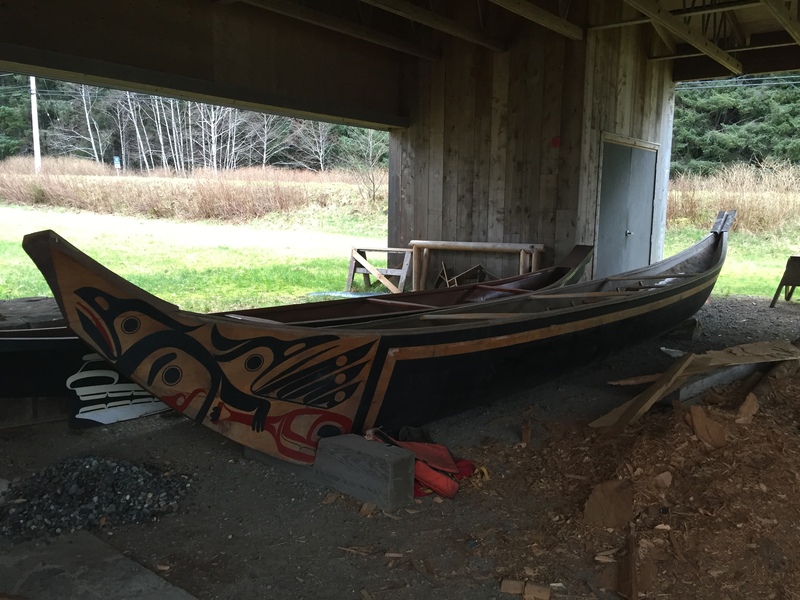 Shaw Ocean Discovery Centre is one of the NEMES project newest partners and will be helping facilitate outreach and ongoing research within the Salish Sea. The NEMES team in the form of Rosaline and Lauren set up their cartoon booth mid morning and before long they attracted their first budding cartoonists! 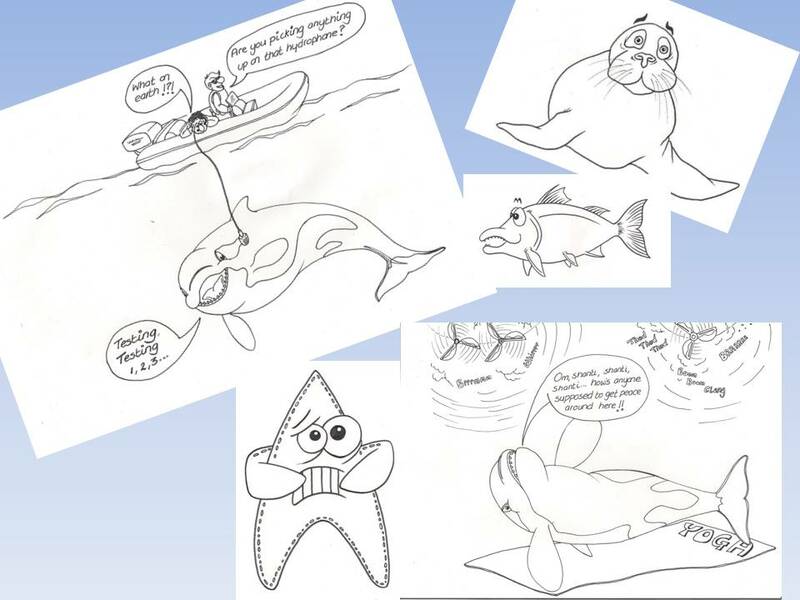 At the cartoon booth, kids and adults had the opportunity to color cartoons designed by Lauren, and take home our ocean noise activity booklet and outreach pamphlet. Also the booth also had a couple of computers and headsets for people to listen to whale calls and samples of vessel noise. While Lauren took on the artistic duties, Rosaline busily entertained and educated the young and old with tales of marine noise and vessel traffic in the worlds oceans. Despite the unrelenting heat all who attended and took part had a great day, learning more about marine life, the creatures, the threats they face and what we can do to help. The NEMES team is looking forward to next year already and would like to thank Shaw Ocean Discovery and those individuals who helped organize this year’s event. For further information about planned NEMES outreach events check out our notice board. On May 19, Rosaline and Norma went to Vancouver for the screening of the film Sonic Sea. Sonic Sea is a 60-minute documentary about the impact of industrial and military ocean noise on whales and other marine life. It tells the story of a former US Navy officer who solved a tragic mystery and changed forever the way we understand our impact on the ocean. The film is narrated by Rachel McAdams and features Sting, in addition to the renowned ocean experts Dr. Sylvia Earle, Dr. Paul Spong, Dr. Christopher. On a beautiful Wednesday morning a group of NEMES researches decided it was time to go on a ‘reconnaissance mission’ to Saturna Island to investigate where would be the ideal location to install a still camera to collect images of vessels navigating the waters along Boundary Pass. Some of the main objectives of collecting this type of data are to determine the type and number of vessels that use these waters, and also help to establish what proportion of vessels carry AIS (Automated Identification System. To answer this second question we will be using AIS information using Oceans Network Canada AIS antenna, which was being installed on that same day. All these new sensors will complement the SIMRES hydrophones that are currently recording ocean sounds near East Point, on Saturna Island. 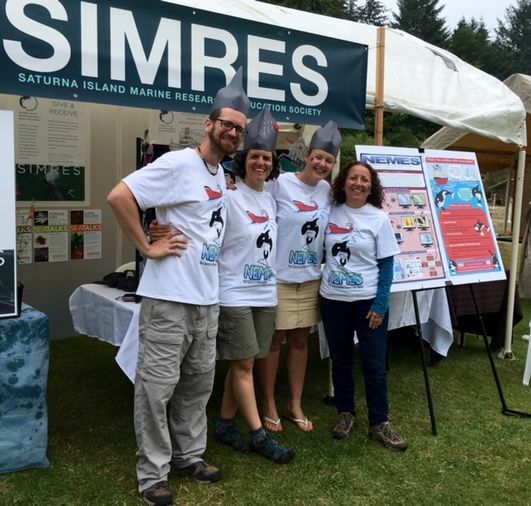 As well as ONC, SIMRES a local Charity organization based on Saturna Island are a key project partner of NEMES in helping to establish this newest component of our research. NEMES also hopes to help SIMRES in achieving their mission to attract scientific research and educational programmes to encourage the development of citizen science and environmental stewardship on Saturna. Our first selected spot was in a private home of a local resident and SIMRES board member, which already serves as a scientific data collection station for DFO’s and ONC’s hydrophone and AIS antenna. During our visit to this prime location we were able to experience firsthand an example of the type of data we are hoping to collect and analyze. 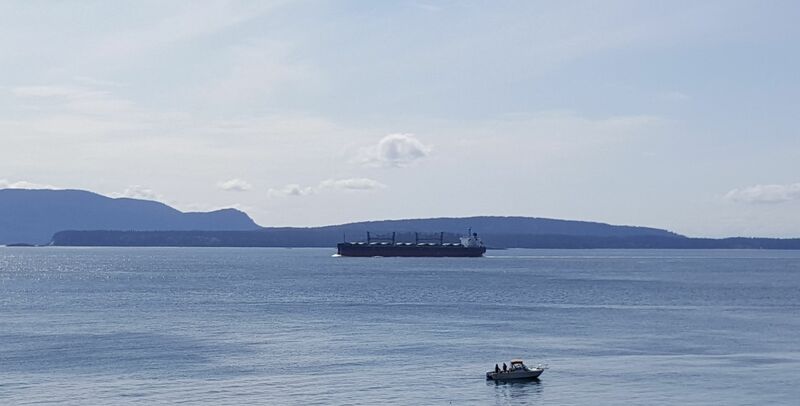 During the couple of hours that we stayed at our study site, we saw several large cargo vessel heading to Vancouver, a navy vessel, and a couple small pleasure crafts. While the cargo vessels and the navy vessel carried AIS and appeared in the AIS tracker the small pleasure crafts and fishing boats did not. Spectrograms before (left) and after (right) passing pleasure craft over hydrophone. Tom Dakin from Oceans Network Canada described the spectrogram below, which shows the sound pressure levels of the transiting pleasure craft from East to West just south of East Point on Saturna Island. Tom explains that the propeller was cavitating badly which is the high intensity noise showing in the spectrograms; it was transiting with its stern sitting in the trough of its bow wave, a very inefficient speed to travel. The spectrogram is in dB re 1µV. So for this particular hydrophone, we need to subtract 10 dB from the plotted intensity to convert it to dB re µPa2. At about 3kHz the hydrophone is receiving 110 dB re µPa2. At about 30kHz the hydrophone is receiving 85 dB re µPa2. At about 100kHz the hydrophone is receiving 60 dB re µPa2. How loud was this vessel? This question can be difficult to answer and depends on who is listening to it, the current ambient noise levels, and how far was the vessel from the hydrophone. If a killer whale was nearby would his/her call or echo location be masked by the passing vessel? Would the killer whale be disturbed in any other way? These and other related questions are the type of questions that the NEMES team is trying to get to. Several members of the NEMES team made the voyage across the Strait of Georgia to the beautiful city of Vancouver a few months ago to attend a busy week of conferences, workshops, meetings and film shoots! While Norma and Rosaline attended the ClearSeas Workshop, Lauren was flying solo when attending the Salish Sea Conference, held this year at Vancouver’s Westin Bayshore Hotel. However, before that she had a packed schedule of meetings with NEMES partners; SIMRES and DFO to discuss collaborations, data sharing and outreach possibilities. On one of the days, SIMRES director Larry Peck had organised a film crew who are currently producing a couple of short films for SIMRES (one of them about marine noise), to interview both himself and Lauren on the shore of English Bay. Despite a few pauses for float planes, mothers with playful children, barking dogs and kayakers, the professional team managed to get the footage they needed. Lauren decided that she had made a good call going into science rather than the performing arts!! The remainder of her week was spent attending the Salish Sea Conference. Not only was Lauren presenting a poster (see below) and giving a talk for NEMES, she had also agreed to help Tanya from MEOPAR host the MEOPAR booth in the exhibitors display. For those of you reading this that have ever had the pleasure of setting up the MEOPAR stand, is there a joke about how many degrees does it take to assemble the frame? After a fair bit of running around Lauren also managed to find a moment to sit in on both talk session dedicated to marine noise. Several NEMES project partners were delivering talks besides NEMES including JASCO and Port Metro Vancouver. In addition there were also several interesting presentations from US colleagues and it really emphasized the importance of cross border communication and how essential attending conferences such as the Salish Sea are in facilitating this knowledge exchange. The evening’s poster session went very well with lots of interest, great networking opportunities and new contacts made. 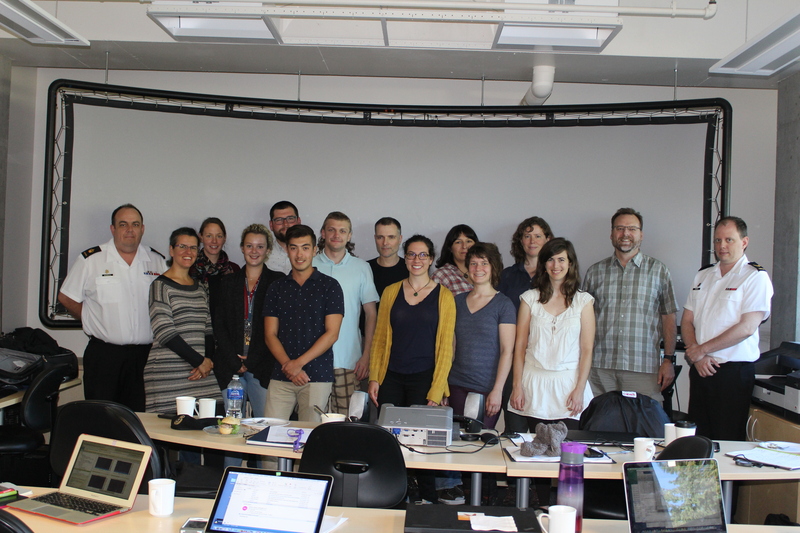 It also provided a chance to touch base with so many of our NEMES co-researchers and project partners. On April 11 and 12, 2016, MEOPAR, Clear Seas and exactEarth organized a two day workshop in Vancouver to discuss “how advances in maritime traffic monitoring and modelling can directly improve marine safety best practices, emergency response and cross-jurisdictional collaboration across the Pacific Northwest”. A number of excellent presentations were given during the first day of the workshop. In the morning presenters provided an overview of marine traffic data acquisition, storage and processing, best practices for the Maritime Domain Management, and different organizations and platforms involved in maritime traffic monitoring. In the afternoon, presentations focus on use cases of maritime traffic data around the world. During this same session, NEMES Principal Investigator Dr. Rosaline Canessa provided an overview of the work we are doing within NEMES related with marine traffic modeling and underwater noise analysis. The final session involved a panel discussion of members from different organizations and backgrounds to discuss public engagement around issues related to perceived risks of marine shipping in coastal communities including Aboriginal communities. The second day started with a keynote presentation by Mr Markky Mylly, Executive Director of the European Maritime Safety Agency. The next session involved presentations around resource-sharing and collaboration, with presentations by Oceans Network Canada, Puget Sound Harbour Safety Committee, ClearSeas, MEOPAR, and Alexander Gillespie, professor from Waikato University, New Zealand. This session was followed by a breakout session to discuss collaboration for traffic monitoring in the PNW. In the afternoon, a panel form by representatives from NGOs, provincial, federal and First Nations government to discuss policy development and implementation. The day ended with a round table discussion around next steps and action plans. Graphics recorded by Yolanda Liman during the workshop. NEMES is represented on the left. All representations, including NEMES presentation by Dr. Rosaline Canessa, were “recorded” during the workshop by graphic artist Yolanda Liman. With the spring weather turning sunny the NEMES team was aching to get out of the office and into the field. 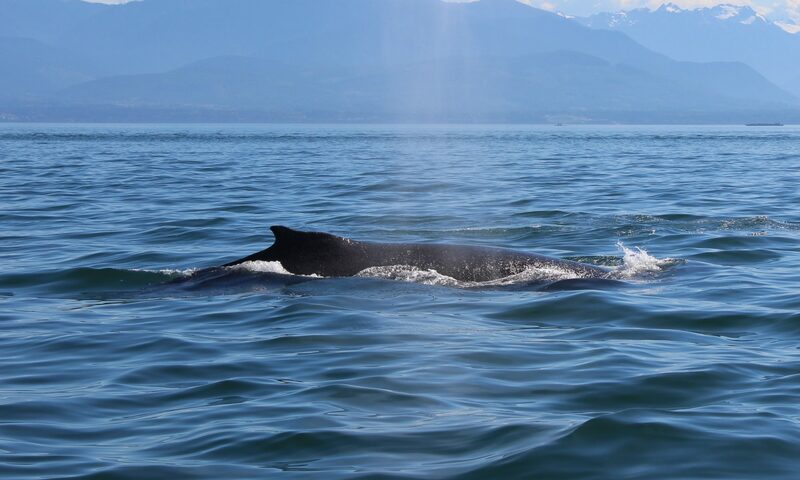 Their prayers were answered on April 7th when Paul Cottrell, a scientist from the Department of Fisheries and Oceans, offered a chance to accompany him on a data collecting trip around the Gulf Islands. Two members of the NEMES team, Lauren and Leh, excited by the prospect of spending a day on the water didn’t hesitate to take Paul up on his offer. Lauren and Leh embarked at 9am on what was shaping out to be a stunning day, the warmest of the week with a summery 20oC on land but slightly cooler on the water. From Swartz Bay, they caught a ferry to Sturdies Bay on Galiano Island to meet up with Paul and the DFO boat. The ferry ride was a pleasant prequel to the boating to come, and a good opportunity to catch up on emails, drink some coffee and enjoy the sights! After arriving at Galiano and locating the DFO Rigid Hull Inflatable Boat (RHIB), Leh and Lauren had about 30 minutes to wait until Paul and another member finished a data transfer at Galiano Inn. Soon Paul and a DFO engineer, David joined them down on the dock and they prepared to embark! The quick RHIB had two 90hp engines and would provide a rapid method of transport around the Gulf Islands. 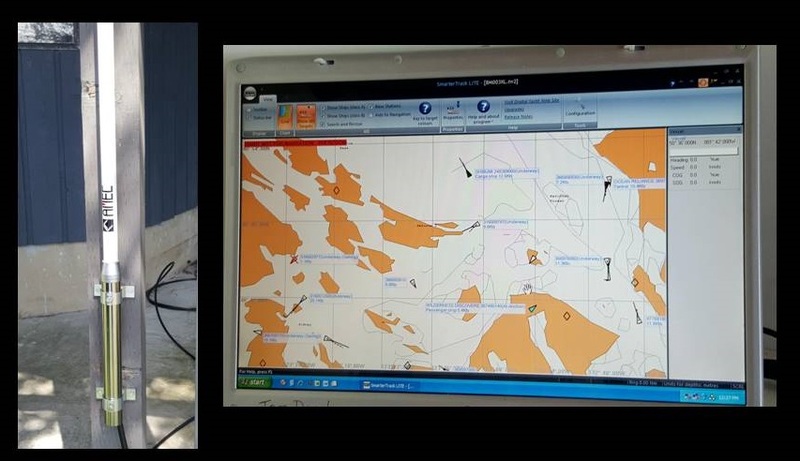 After leaving the dock at Galiano and inspecting the data transfer system attached to the BC Ferries dock in Sturdies bay, the team motored across to the adjacent Miners Bay on Mayne Island to inspect the future position of a new DFO hydrophone. In Active Pass eagles and sea lions congregated on a herring bait ball metres from the boat. Lauren scrambled to find the camera but the fast moving RHIB was quickly out the other end of the channel before Leh had a chance to loosen the lens cap! Just outside the southern entrance to Active Pass, the team observed a solar powered hydrophone array housed on a navigational lighthouse. From here, the team continued their Gulf island voyage to Pender island. The RHIB passed through the channel between the South of Mayne and North Pender and around the island into Port Browning, a small cove on the inside of North Pender Island. Paul then navigated the team through the small canal and under the wooden bridge that separates North and South Pender. Fortunately, the boat was compact enough that manoeuvring through the 10-metre-wide canal was not a problem. Our next stop was Poets Cove Marina on South Pender to refuel the boat. Once refueled, the team visited a hydrophone array located on the southern most tip of South Pender Island, Tilly Point. Here, the RHIB was pulled close to the beach in a small, protected bay to disembark and acquire data stored on land. Lauren, then decided to explore the beach up close, and face planted into the pebbles apparently forgetting how to jump when disembarking the vessel, alas distracted by nearby basking seals, Leh missed this prime photo opportunity! After hauling Lauren off the ground they ventured up the beach on to the property Paul uses to store his data storing equipment. Here they had the opportunity to listen to the hydrophone live as Paul accumulated data. The boat moored in the small bay made for some picturesque scenes with Mount Baker breaking the horizon in the background. When they were collecting the hard drive they had the good fortune to listen to the hydrophone as it recorded a large cargo vessel passing by South Pender, further establishing in all their minds the purpose of NEMES’ project to monitor underwater noise. After casting off from Tilly Point in the RHIB they motored north to past Monarch Head, the location of another non-DFO hydrophone. At East Point they stopped at the next DFO Hydrophone location. Paul disembarked the vessel to collect the data and David, the other member of the DFO team onboard idled the boat offshore until Paul’s return. The steep rocky shoreline did not allow for a nice beach landing like on Tilly Point! This hydrophone, similar to the one on the south end of Active Pass was also solar powered. During our wait we discussed the set-up of the hydrophone arrays and how they are powered. This information, and possible collaboration with DFO is useful as NEMES is planning on putting together self-sustained camera emplacements throughout the Salish Sea to monitor vessel traffic. Once Paul returned to the boat it was time to get back to Victoria. The afternoon had disappeared in an instant and the bright sun hung a little lower in the sky. The late afternoon light and drop in wind turned most of the protected waters of the Gulf Islands into glass, which made for a smooth ride home. After a smooth docking at the Government Dock at Swartz Bay we said our thank you’s and goodbye’s to Paul and David for a fantastic afternoon in the spring sun! The NEMES team gained useful knowledge into the creation and placement of data collection units and there is no better way than to do that than spend a sunny day on the water in the beautiful Gulf Islands. Lauren and Leh, noticeably rosier cheeked than 6 hours earlier drove back to Victoria for a nice cold beverage in Cadboro Bay. There they reunited with the other members of the NEMES team who’d gathered at a local pub to celebrate team-member Rob’s birthday! Happy birthday, Rob! On March 7th the NEMES team was fortunate enough to have the opportunity to join the National Aerial Surveillance Program (NASP) on one of their flight missions. The flight had been talked about and finally, after a few reschedules due to the increment West Coast weather we managed to get airborne! NASP’s primary purpose is to monitor for oil spills and deter illicit polluters. Utilizing a suite of remote sensors and cameras, the NASP DASH-8 aircraft patrols the coast in search of spills from large international vessels, commercial vessels, recreational vessels, and marinas. The NASP program has been helping the NEMES team collect data on non-AIS transmitting vessels in the Salish Sea, one of NEMES’s areas of interest. The NASP team is able to do this because the DASH-8 is fitted with an AIS sensor. By capturing data of non-AIS vessels, the NEMES team is able to develop a better idea of the proportion of AIS to non-AIS vessels in the Salish Sea, important to identifying contributors to marine noise pollution. The NEMES team, including Lauren, Norma, and Leh, got the word Sunday evening that the flight was a go on Monday morning. A mere 12 hours later they were up and ready to go on what was turning out to be a wet, smocked in morning in Victoria. After a quick drive out to the airport we were greeted by a member of the NASP team who, along with the NEMES team would be picked up at Victoria International Airport. The team stocked up on coffee at the Victoria Flying Club’s cafe and once the plane had touched down proceeded to meet and introduce with the staff aboard the NASP aircraft. A brief discussion about data collection was wrapped up and the NEMES team excitedly readied themselves to get up in the air! The team was brought through a safety briefing aboard the DASH-8, which included procedure in case we had to land in the sea! Everything was said a little more transparent than on a commercial airline which, with all the risks detailed was somewhat unnerving for certain members of the team. With the clouds beginning to lift, and the rain ceased the pilots of the DASH-8 prepared for takeoff! Leh was stationed in the cockpit for the takeoff in what is called the ‘jumpseat’, an awesome experience as we took off flying low over Victoria. Approaching the mouth of the Strait of Juan De Fuca we patrolled for any leaks coming out of inbound tankers before heading up the coast towards Tofino. The trip up the coast provided an excellent opportunity to sit in the observer seat, and watch the operation of the sensors by one of the members of the NASP team. The impressive sensor array with different lenses and wavelength modes allowed for detailed inspection of the sea surface and vessels below. After investigating the marinas at Ucluelet and Tofino, we continued up the coastline, with the dramatic and weathered rock on our right and the vast Pacific Ocean on the left. At Brooks Peninsula, we investigated a possible oil spill, but this turned out to be dead jelly fish, or Velella, washing up on the shore. After a few tight, slightly gut wrenching low altitude turns we leveled out and headed towards the Northern tip of Vancouver Island and Port Hardy, Lauren’s favourite place. Near Port Hardy, the NASP team identified two small spills and circled the areas of interest documenting the spills with a DSLR from the observers seat and the on board sensors. From this point, with time running out, the aircraft sped down Johnson Pass, passing the industrial ports along the inside of Vancouver Island. It was on the way down to the fascination of the NEMES team we observed the extent of the Herring spawn, turning the sheltered waters into a milky blue colour. The sheltered and calm interior of the island was a stark contrast to the dramatic short lines detailed with jagged rocks that rung the outside the island. After completing one final collection of non-AIS vessel traffic off of Nanaimo, the NASP crew and NEMES team buckled their seatbelts, with Lauren now in the cockpit with the pilots on their final descent back into Victoria before the aircraft heads back to Vancouver. A smooth landing followed and the DASH-8 only shut the passenger side engine off as the NEMES team said their thank you’s and disembarked the plane. Reflecting on a surreal day in the air that included a circumnavigation of Vancouver Island in just over three hours the team finished off their day back in Sidney, enjoying a tender lamb souvilaki’s from Maria’s Greek Restaurant. 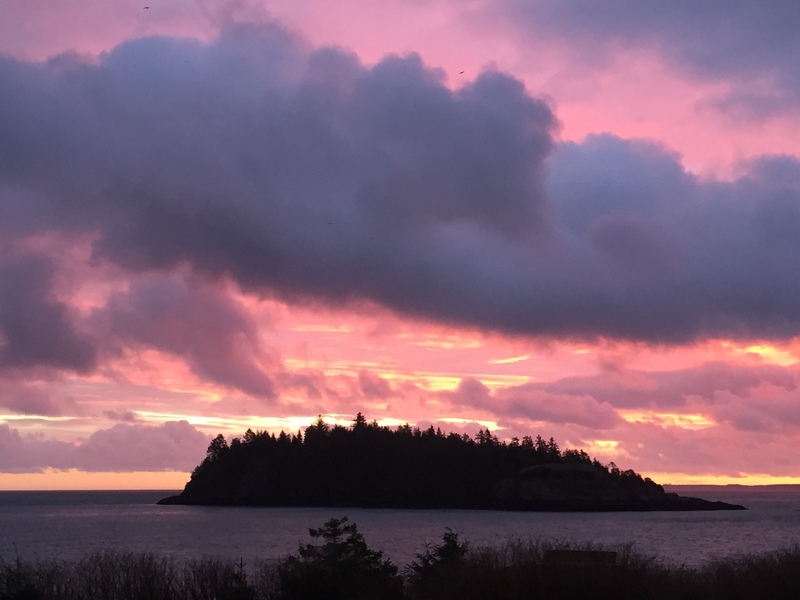 It’s been a month of exciting adventures for the NEMES team and it ended with two of us (Rosaline and Lauren) heading up to beautiful, mystical and amazing Islands of Haida Gwaii (a bucket list destination for one of our team). This remote destination is one of the three study areas that NEMES currently deals with, or rather an area almost 200 km west of Haida Gwaii where the SGaan Kinghlas Bowie Seamount is located. Over the past year the NEMES team has been working alongside DFO and the Haida Nation to analyse the vessel activity and marine mammals located at this environmentally significant location. So armed with their findings, including several hundred maps and a few whale recordings they boarded their plane bound for Sandspit airport. To their horror they found out that Haida Gwaii had been issued a severe weather warning for that afternoon/evening with the weather station forecasting 110 km winds. Suddenly their coffee and doughnuts weren’t sitting too well in their stomachs. Boarding a notably petite plane the two travel companions decided to try and sleep their way through any turbulence, a plan that almost worked perfectly if it hadn’t been for them both waking just before coming in for the decent. After an impressively smooth landing they were almost blown away like tumbleweed across the tarmac as they tried to clamber their way down the stairway and into the terminal building. Safely on board the shuttle bus bound for Skidegate they began to relax a little before the reality of a windy ferry crossing started to cross their minds. Again their fears proved unfounded as they had a relatively smooth passage across and got their first real chance to view the beauty of Haida Gwaii. Having survived the crazy winds of the first night our two intrepid researchers ventured out to explore some of the island before the workshop began the following day. Heading up Island they visited Masset and Old Masset checking out their famous totem poles and stumbling upon some beautiful carvings. It was also interesting to witness the public signage in protest of the Enbridge oil and gas developments. The people of Haida Gwaii are definitely invested in their environment and made them think further about their own work increasing ocean literacy within NEMES and about how they can effectively engage the public with the issues related to marine noise. 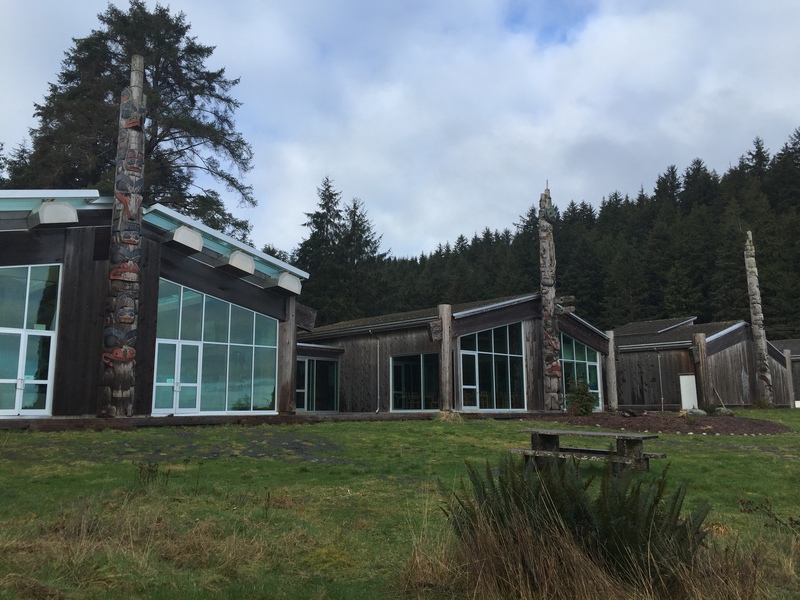 The workshop was hosted at the Haida Heritage Centre in Skidegate, an impressive building that looks out over the narrow water ways that link the North and South Island. 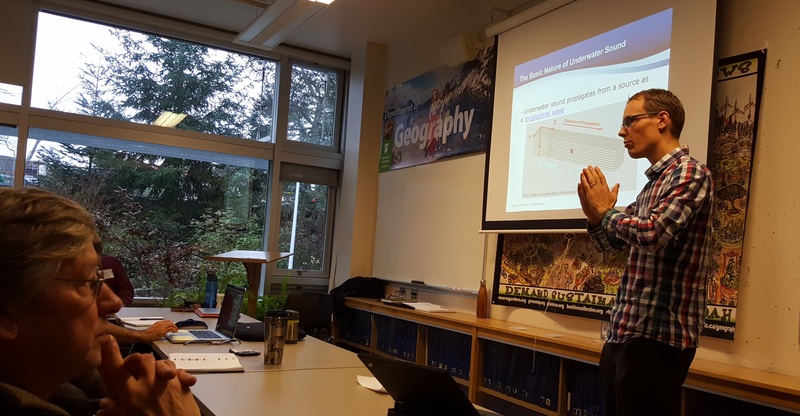 During the first day of the workshop the NEMES team presented the findings to representatives from DFO and the Haida Nation on our projects work on mapping vessel activity and marine mammal presence at SGaan Kinghlas Bowie Seamount. Our presentations on vessel activity around the seamount and within the MPA in particular proved to be very interesting as up until this point many who attended had been unclear as to the level of vessel activity in this remote area. General discussions about the vessel patterns and analysis naturally led to several new questions about not only the data, but management of the seamount and the associated risks (including from noise) that could result as a consequence of this activity. Following these discussions they were also presented with the first part of our analysis work on the recordings from the hydrophone DFO have deployed on the seamount. Participants were given the chance to hear some recordings of marine mammal vocalisations taken from SGaan Kinghlas and told a little about those species present at the seamount. The second day of the workshop allowed us to answer some of the questions that had arisen from the previous day’s discussions. The Day 2 workshop had additional new people in attendance from the SGaan Kinghlas MPA management advisory board, many of whom had interesting questions and observations to make about the data that had not surfaced on the previous day. After another long productive day of discussions and presentations the NEMES team only just manage to squeeze in a quick visit around the Heritage Centres museum, containing lots of amazing stories, artefacts and artwork. The centre even has a live feed to a hydrophone recording in the waters just outside in the bay, which was something that excited the NEMES team immensely. Unfortunately, all was silent but the museums director assured us that they hear whales and vessels passing quite frequently. So with dreams of potential outreach possibilities for their work at the SGaan Kinghlas and LOTS more research questions still to be answered the NEMES team headed home after their grand adventure to Haida Gwaii. It has been 20 years since one of them had last visited but they both hope they will make it back far sooner than that this time! 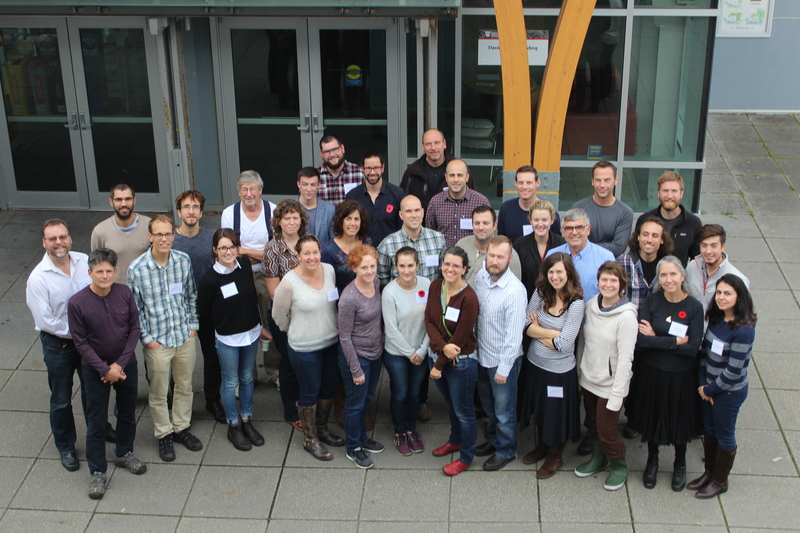 On the 17th and 18th of February, 2016, experts from across Canada and North America arrived at the University of Victoria for their first MEOPAR sponsored workshop on ‘Marine Acoustics in Relation to Whales and Noise’. This workshop had been a long time in the making and the product of many discussions between the Primary Investigators (PIs) of three MEOPAR sponsored research projects that are all tackling various issues to do with marine noise pollution. The WHaLE team, based primarily out of Dalhousie on the East coast and led by Dr Chris Taggart, had the furthest to come followed by the 3MTSim team under the leadership of Dr Jérôme Dupras based primarily out of the Université du Quebec. Our team (NEMES) led by Dr Rosaline Canessa had pitched the idea of holding this workshop in Victoria, with the smell of cherry blossom in the air and sunshine streaming through the windows, our colleagues to the east were more than supportive as long as we agreed to supply coffee for those suffering from taking the red eyes to be here! As it turned out many peoples travel plans were somewhat shaken up by a nasty snow storm that hit Toronto. But over the course of day one all participants eventually arrived safe and sound. Day 1 started with some short presentations from the three research teams and invited guest speakers that are associated with each of the projects. We heard about the WHaLE teams glider work in the Atlantic and Pacific coast, 3MTSims success in slowing shipping traffic in parts of the St Lawrence and NEMES cumulative mapping of noise from vessel traffic in BC and the Arctic. The aim of Day 1 was to identify synergies between the current projects and create opportunities for future collaborations. The presentations from experts representing JASCO, Oceans Initiative, WHOI, Canadian Navy, DFO and GREMM focused on what they could contribute to these projects, what expertise/resources they can contribute and what they need to advance their ongoing future work and interests over the short- medium- and long- term. In the afternoon, the group split into two to discuss either acoustics in relation to whales or acoustics in relation to vessels, although it was acknowledged that there would be some inevitable overlap in discussion! The organisers were pleasantly surprised to find a relatively even split in numbers, if only that could be attributed to their great planning!! Lots of active discussion were carried out by both groups, and a herculean effort was requires by the note takers to transcribe all the ideas and questions that were flying between the participants. On Day 2 the original group were joined by some fresh faces (and minds) from Green Marine, BC planners and Vancouver Aquarium. 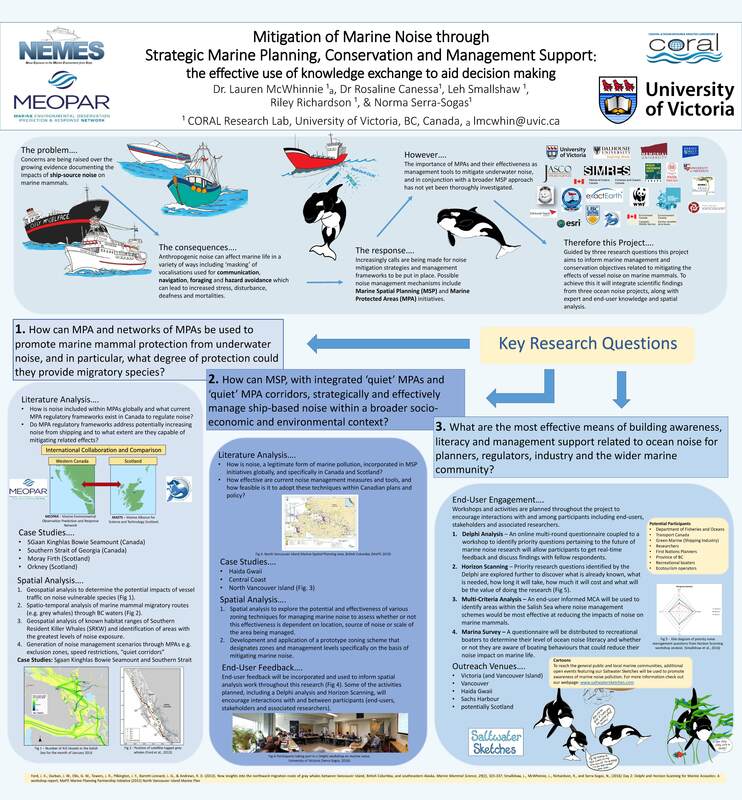 Part of the workshop was designed to introduce potential new connections to MEOPAR and the research groups that are currently working in their area of expertise. The second day centred around the participants under taking a Delphi questionnaire and a Horizon Scanning exercise in order to identify and reach a consensus on priority research questions in the field of marine acoustics in relation to vessels and whales. Many of the questions discussed incited passionate and at times heated discussions about the legitimacy of their claim at being ‘most important’. Indeed, the intensity of the discussions proved to be extremely thought provoking and only served to highlight the variety in not only what people deemed to be important but also what we perceive to be known about many elements of this area of research. Hopefully the workshop proved as interesting and fruitful to all those attending as it was for ourselves. The general hope is that this will be the start of something bigger between the three research groups. So stay tuned for follow ups and the next stages of this collaboration! After the concluding remarks at the end of Day 2, many of the participants were in dire need of some relaxation and what better way to recharge the mind than with some MEOBeers! Thanks to Dugald Thomson who organised a brewery tour to Phillips Brewery ….some minds were more relaxed by the end of the evening than others. On behalf of the NEMES team we would once again like to thank all of you that attended and participated so passionately in this workshop, we hoped you enjoyed the experience as much as we did and hopefully will see you all again in the not too distant future! On the first of February three bleary eyed MEOPeer from the CORAL research lab at the University of Victoria made their way to their local airport for their early morning flight to Calgary. After an envy inducing short flight, their energy levels were replenished with coffee and a box of TimBits while they eagerly awaited the arrival of their fellow MEOPeers at the Banff Transporter arrivals desk. After greeting both familiar old friends and new acquaintances they board the Banff bound coach in search of adventure and fun, some travel companions proved better than other; open snoring mouths can somewhat detract from beautiful mountain views! Upon their arrival in Banff the CORAL MEOPeer’s were allocated their suites and after a quick freshen up they quickly realised that their fuel tanks were getting dangerously low, panic stricken at such a thought they ventured out into the chilly Banff air in search of brain food! Waiting for the resort shuttle they quickly realised they were not alone in need for subsistence and were joined by several more MEOPeers from different projects. Apparently one thing that can quickly secure life-long friendships is a need for Mexican foods and beers! And so the CORAL MEOPeers found themselves tucking into enchiladas and tacos with a research group from Newfoundland, all the while being very careful not to bring up the issue of tiredness and early morning flights! Energy levels once again boosted the group then braved the cold to explore Banff and meet some of the locals…. Tanya Crawford (every MEOPeers Fairy Godmother) and her team had arranged an evening meet and greet session so it was soon time for us all to get back into the resort bound shuttle bus and meet some more MEOPeers! Fun icebreakers ensured that everyone received a good shuffle around and provided us with an opportunity to meet up with some fellow researchers, who although they may not have had anything in common with our research project, all agreed on their favoured beverages! A painful early morning start was lessened with coffee and warm croissants and then we were quickly into our first workshop session of the week – Photography as a Research Tool, a subject that some of our team were particularly interested in learning more about. After a morning session that resulted in a ‘wish list’ of equipment for our PI’s and a deeper appreciation for the skills involved in achieving perspective, correct lighting and a pleasing composition, we were given the opportunity to try out our eager, if not skillful, photography on some beautiful and ancients fossils. In the afternoon we all bundled on the layers and packed ourselves into coaches that transported us out to Banff National Park. Cameras at the ready we soon exercised our fingers snapping at all the beautiful scenery. Our suspicions were that this was confidence boosting exercise as with scenery like this how could you fail to take an incredible picture! And of course the CORAL research team just couldn’t resist the urge to indulge in a mountain selfie! Another day another new workshop: Wicked Problems and Trandisciplinary Research, today we had the opportunity to learn about ‘wicked’ problems, which is incidentally very hard to say without accompanying it with an emphatic arm movement that results in clicking fingers (we all know the advertising campaign!). A wicked problem is an issue that is difficult or impossible to solve because of incomplete, contradictory, and changing requirements that are often difficult to recognize. Perhaps almost all of the work undertaken in MEOPAR should be classified as ‘wicked projects’ and ours is no exception! The instructor encouraged us to map out our respective projects, no wonder our heads always feel so full! In the afternoon session the MEOPeers were immersed in the world of Team Science and the Science of Team Science, a very important topic for many a MEOPeer as most of us are involved in project that include members based in different institutions across Canada. Some of us poor unfortunate soles even have the task of trying to coordinate and manage our vast and ever expanding groups of researchers and stakeholders and this workshop provide many helpful insider tips about how to accomplish this more effectively. After a hard day of thinking our minds once again required some fuel and of course MEOBeers! Tanya and her team had organised a coach to take us to ‘Wild Bills Saloon’ for steaming piles of chicken and garlic mash. In the interest of being sociable and of course encouraging interdisciplinary collaboration many of the MEOPeers painted Banff Blue well into the night sharing research stories, academic notes and regional cocktail recipes with each other! Not one of the MEOPeers started the day anything other than bright eyed and bushy tailed…. well OK perhaps some were feeling the previous nights socialising a little bit!! but luckily for them the fairy godmother had her wand out and delivered a hot cooked breakfast to ease their suffering and kick start the day! The final days workshops saw the MEOPeers split into three different groups each focussing on a different set of research skills, fortunately the CORAL MEOPeers all opted for different workshop and were able to experience the full range of expertise on offer. The Scientific Visualization workshop introduced MEOPeers to an open-source data-analysis package called Paraview; a software that excels at displaying both qualitative and quantitative data in three dimensions. Throughout the workshop MEOPeers were shown various methods of displaying data and encouraged to explore the functions within Paraview using both the user-interface and the command-line. Given the ‘exertions’ of the previous evenings ‘networking’ this proved to be a great way to spend the Thursday morning, (behind a computer screen with a coffee) with an exercise that provided just the right amount of mental stimulation! At the end of the day, all the MEOPeer’s were itching to take their own data and turn it into a beautiful three-dimensional data output for all to see! This workshop was split into two section one focuses on the development of apps to help inform our research projects and the second looked at communicating science through different media outlets. We listened to several talks including one from a fellow MEOPeers about using an app to track whale movements in real-time, thank goodness they haven’t yet developed an app to track MEOPeers in real-time! There was also a remote presentation from a researcher in Europe who had stayed up well past his bed-time to tell the MEOPeers about the app he had developed, modern technology how did we live without it! Speaking of technological advances the MEOPeers were also playing guinea pigs for a new app Tanya and co. are hoping to roll out at MEOPARs ASM this summer. Not only did it cut down on paper work it also proved a huge hit among the MEOPeers particularly as a photo sharing platform, oh and of course a handy tool to aid in organising MEOBeers in the evening! This workshop was highly interactive and a challenging experience for all involved however as daunting as standing up and being videotaped in front of your peers can be, it’s also highly rewarding! Humility can be the greatest strength a scientist can possess going forward in your career and exposing yourself to a camera and audience proved to be really great exercise! Be afraid anyone that gets in an elevator with a MEOPeer they are now armed with the skills to captivate and entertain you!! So after the closing words by Tanya and her crew, including a moving tribute to MEOPARS late scientific director Neil Gall, the MEOPeers said their goodbyes to Banff and headed for Calgary airport after what had been a long and tiring week for the newer members of the group the older stalwarts were keen to get home and put into practice all that they had learned! To all the MEOPeers at Banff 2016 we look forward to seeing you again in the not too distant future and our thanks once again go out to MEOPAR, especially to Tanya and her crew for organising such an enjoyable, entertaining and educational event! Until next time MEOPeers!! !